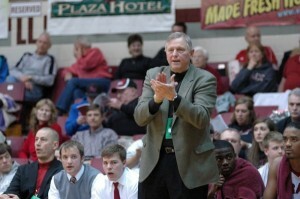 An article on the online news site, InkFreeNews.com, anticipates a milestone 700th win for Grace College men’s basketball coach, Jim Kessler. It’s a mark he never expected to meet, but it could come as early as the season opener on Friday night. A portion of the story appears below. Click here to read the complete article. WINONA LAKE – Grace College men’s basketball coach Jim Kessler, in his normal humble manner, says he has nothing to get the big head about when he looks at his record. The man, affectionately and respectfully known as “The Godfather” on the campus he has called home for the past 37 years, sure does have plenty to be proud about though. The selfless Kessler is set to join some elite company come as early as Friday night. Kessler begins his 38th season in charge of the Lancers with 699 coaching wins. A victory in the season opener Friday night in the Manahan Orthopaedic Capital Center versus Concordia will make him just the 45th coach in men’s college basketball history to win 700 games. Kessler, a man known for his commitment, consistency, character and class, has one simple goal for Friday night. Kessler, for whom the court in the fabulous MOCC is named, is about so much more than his 699-526 record in 37 seasons at Grace.